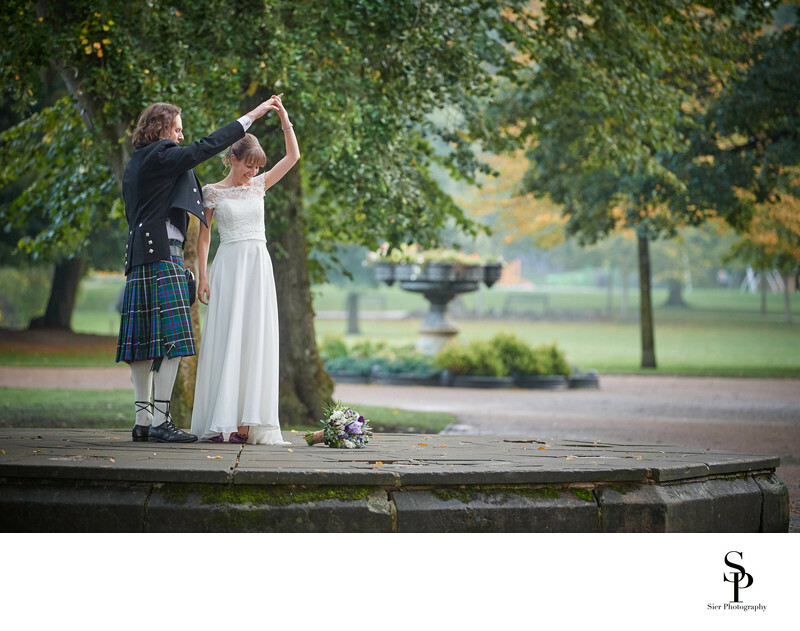 This is an image from the first wedding we have photographed in Buxton, Derbyshire. The wedding took place at the historic Old Hall Hotel opposite the Pavilion Gardens where this particular image was captured. It had rained hard all day but just as the light started to fade into night, the rain stopped and the sun appeared briefly, just long enough for us to take the family formal photographs and take a walk around and explore The Pavilion Gardens. it is fantastic for us as photographers and creatives, to visit somewhere new we haven't photographed at before. While it is wonderful to work in some of the venues we are lucky enough to work in, and to get to know some of the fantastic locations for images while building working relationships with the staff there, it is also wonderful to seek out and explore new venues, and have the chance to create something from scratch. Buxton is a wonderful place, a very old town with some serious history and some amazing architecture and a wonderful place in which to create some art for, and including our couples. The Old Hall Hotel is a building of some historical significance and is reputed to be England's oldest hotel. The building has housed many famous people over the years including probably its most famous guest, Mary Queen of Scott's who scratched a farewell message into one of the bedroom windows shortly before she left Buxton for the final time. 1/400; f/3.2; ISO 2200; 170.0 mm.